Knockando can trace its history back to 1898 when it was established by an Elgin spirit broker, J Thompson. In Gaelic, Knockando (Cnoc-an-dhu) means "little black hillock" and the distillery sits on a tree-covered hill that overlooks a sweeping panorama of the Spey river. 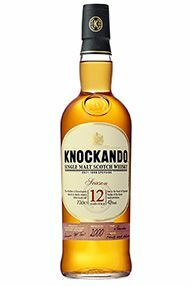 Knockando differs form other malt producers in its long-standing practice/philosophy of bottling the casks only when they are deemed to be at their peak maturation, as opposed to bottling them automatically at certain ages. The whisky is marketed as single malt under its season of distillation; the year of bottling is also indicated on the label. The notion being that the whisky is bottled when it is mature, rather than at a specific age. The use of sherry casks is deliberately kept to a minimum in order to preserve the delicate flavour of Knockando. The little black hill as Knockando translates lies on a bend of the Spey near Aberlour. The malt is used in J&B, adding to the blend a great elegance. The flavours are soft but complex with raspberry, marshmallow and nutty, toffeeish dryness.